First Listen: Joyce Manor, 'Never Hungover Again' The SoCal punk band's Smiths obsession makes for a confident, focused, 19-minute record that still gleefully indulges in pick scrapes and fast three-chord songs. 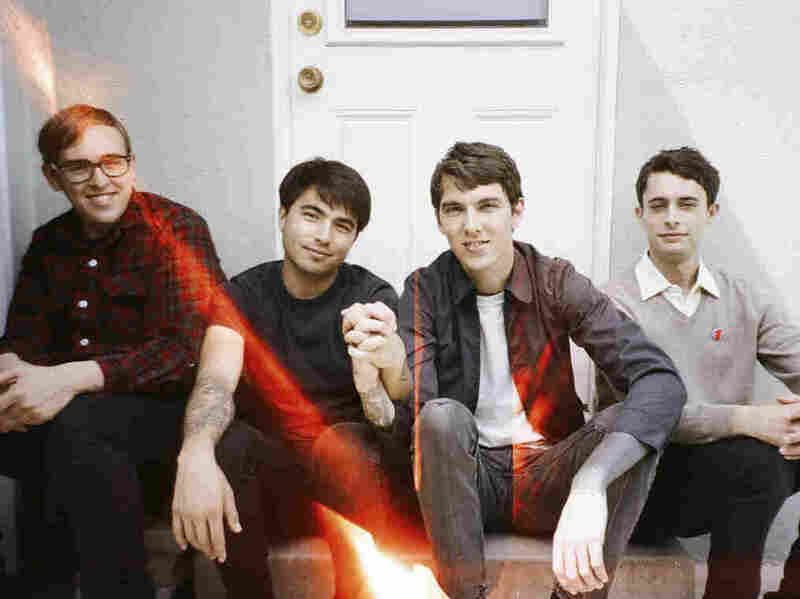 Joyce Manor's new album, Never Hungover Again, comes out July 22. Never Hungover Again begins with a cold open — just a one-second chord and vocalist/guitarist Barry Johnson "looking at your face in the dark" — of a lanky pop song that already seems to be in progress. Joyce Manor has never been one to extend the drama, with albums shorter than it takes to watch an episode of Space Ghost Coast to Coast; the punk band can pack an emotional wallop with as much as a yelp. Now on its third album, the Torrance, Calif.-based band has embraced the shades of The Smiths that were merely suggested previously. Johnson could never be mistaken for Morrissey, but he's mostly ditched the scream for a nasal SoCal pop-punk croon that bounces over careening Britpop guitars in songs like "Schley," "End of the Summer" and "Heated Swimming Pool." But it's "Falling in Love Again" — with its jangly power chords, melancholy single-note melody and a sudden sweep of synths — that might be the most Johnny Marr-like of this bunch. That said, Morrissey might think twice about singing, "I think you're funny / I like your friends / I like the way they treat you." Even in Never Hungover Again's most straightforward punk songs, lessons have been learned from The Smiths. "Victoria" lets full chords ring out — and wrings every hook out of the namesake's syllables in the chorus — while "Heart Tattoo" subdivides a pogo-ing rhythm with stuttered, melodic guitar picking. It makes for a confident, focused record that still gleefully indulges in pick scrapes and fast three-chord songs.